A 3D printer developed by Made in Space will fly to the International Space Station. Image released on July 29, 2013. WASHINGTON — Technological innovation isn't necessarily one size fits all for NASA. NASA is working with private industry to craft new technological innovations that will help spacecraft travel to space more efficiently than ever before, but different missions have different needs, NASA chief Charles Bolden said Tuesday (July 23). For a future mission to an asteroid, Bolden is focused on creating a propulsion system that can get a NASA spacecraft to a space rock that could then be delivered into orbit around Earth. Although ion engines are reliable and could propel a spaceship to the proper distance, the craft would still need solar cells that could create electricity to power the engines into the far reaches of space. Solar cells that powerful aren't flight-ready yet, Bolden said. "If you're talking about the asteroid initiative, we're talking about launching in 2017 or 2018 because it's probably two or three or more years to get there, to meet up with this thing and then another couple of years or so to get it, if it works, steered toward lunar orbit in order to have it there in 2023," Bolden told SPACE.com here at "NASA Tech Day on the Hill." 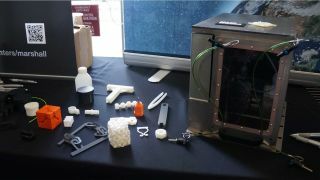 NASA's tech day showcased a number of new tools, from 3D printers that work in microgravity to innovative fuel cell designs. The day also highlighted some of the complexities created by space travel. A human mission to Mars presents its own unique technological barriers to overcome. "The biggest thing if you're talking about a human mission is radiation mitigation, radiation protection. We know shielding, but that's weight, so we've got to come up with something that's much less weight than anything we've ever seen before. Things that work great like water are weight. I've heard a lot of different ideas people have had." The added weight of shielding water and other materials would be too much of a burden for a spacecraft trying to make it into deep space. Instead, scientists are trying to develop either lightweight shielding or another technological innovation that would help protect astronauts from radiation exposure on long-duration missions. Some of those technologies could also have biotech components, Bolden said. "Medical people are looking at prophylactic things that you would ingest that would enable the body to heal itself. You just say, 'OK, we're going to let the high-energy particles beat us up, and we're going to heal.' Computers do it all the time." Some computers can diagnose themselves to repair problems in the system, and Bolden hopes that new technology will enable scientists to do the same with the human body. That dream is still far in the future, however. "Most people tell me that's way further off than some really high-tech shielding that's much lower weight, but they're all racing to get to the finish line at the same time."